The first thing that is required in order to start using your customized online time sheet system is to fill out the required information using the set up wizard. The first page you will see will be for Company Information. The minimum requirement is a Company Name. We recommend filling out as much information as possible. Once you have finished filling out the form, click save and then click next and the set up wizard will take you to the next bit of required information. 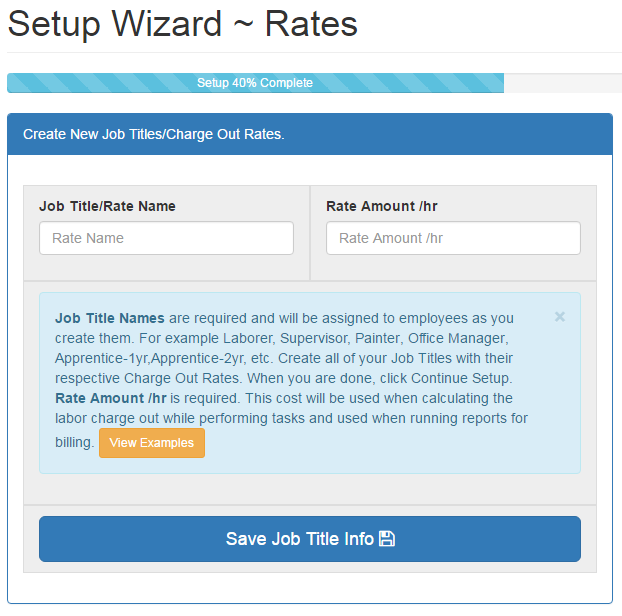 Job titles and charge out rate amounts are created and assigned to each user. The name of a job title corresponds to a charge out rate. The charge out rate is the rate that you charge the client and not the employee wage. For example, if you bill your clients $40.00/hour for a carpenter you would enter Carpenter in the Job Title field and 40.00 in the Rate Amount field. Each job title has it’s own charge out rate amount. Employee wages are entered in another step of the set up wizard. When creating users, you will need to supply a First Name, Last Name, Email, Charge Out Rate, Wage, In house cost, and set the User Type. The Email must be unique as it will become the log in user name. The Charge Out Rate was previously defined in the set of Charge out Rates/Job Titles that were created. The Wage is what you pay your user hourly. The In House Cost is the amount the employee costs your company after adding the additional expenses such as WCB, EI, Vacation pay, Benefits etc. There are three User Types with privilege settings to choose from. Administrator, Managerial (Foreman/Supervisor), and Standard user. This setting dictates what the user can and can’t do and see. A standard user can submit their time sheets, and make changes to time sheets that haven’t been approved/locked. The Managerial (Foreman/Supervisor) users can do everything a Standard user can do as well as review and approve time sheets for users that are working on job sites that they have been assigned to and are in charge of. They can also add new projects and modify the current task list for their projects. An Administrator user can do everything a Managerial (Foreman/Supervisor) can do as well as run all reports for payroll and billing. They are also the only users that can configure the time sheet system. They can add and modify users, Charge out Rates/Job Titles, Tasks, and Projects. They can also export all reports into CSV, XLS, or PDF to their desktop. Optionally, you can also click the checkbox to allow the user to track mileage when they submit their time sheets. 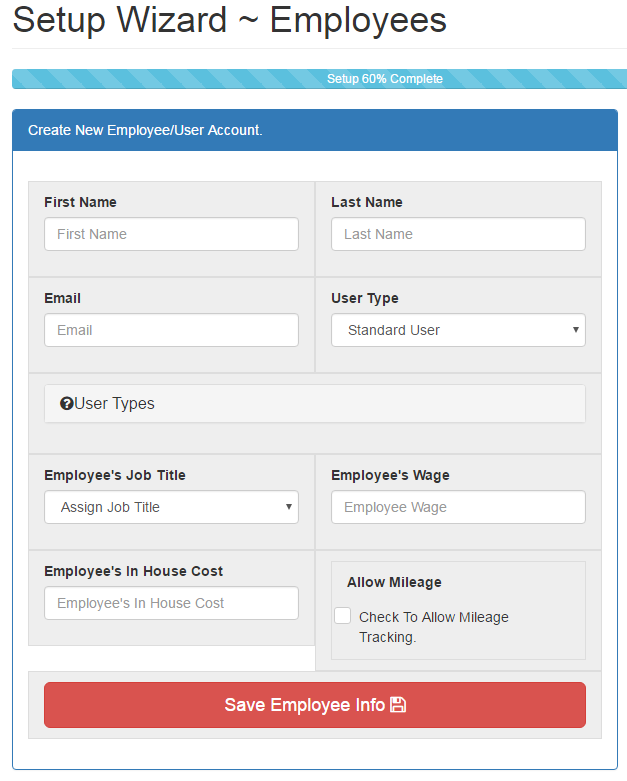 If you have an arrangement with the employee to pay them for their personal vehicle usage, you can click the check box to allow mileage tracking. By default, this is turned off for all new users. 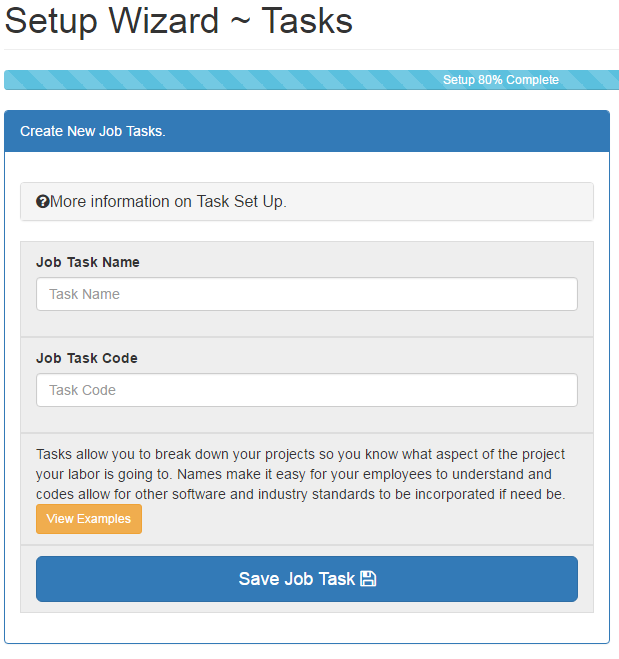 Job Tasks and Task Codes are used to track what is being done on a project. Tasks require a name and that is what will be seen in the dropdown select box when a user submits their time sheet. In addition to the name of the Task, a Task is also assigned a code. These codes can match job cost codes which can be used to synchronize information with other 3rd party software like accounting software or project management software. The minimum requirement to set up a Project is by giving it a Project Name. A project address is a good example. You can also enter additional information for each project. You can enter an Optional labor budget amount. This will be used to track costs so you can see where you are at with regards to charge out rates and in house costs per project. By default, whoever sets up the project is assigned as the Foreman/Supervisor of that project. You can change this by selecting another user from the drop down. This field is populated with any user that has privileges above those of standard user. Also, in addition to this information, you can set up a Foreman/Supervisor Report. This is 5 additional fields that allow you to enter up to 5 questions that you would like the Foreman/Supervisor of the project to be able to answer. For example, you may want to know if there were any change orders requested that day, or what the weather was like, or if the client was on the job site that day etc. This report is optional and will be available to the Foreman/Supervisor at the time when they submit a time sheet for that particular project. This report is then formatted and emailed to the email provided in the report set up settings. 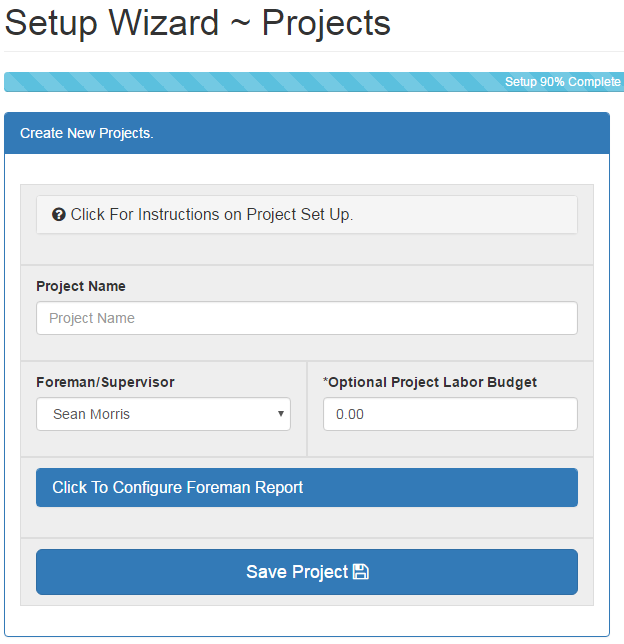 The last step in the Set up Wizard is to assign the tasks that you are working on to the projects that you set up. Each project can have different tasks being done at any given time. This allows you to control exactly what a user can assign their time to when submitting time sheets. As tasks are completed, you can remove them from the assigned list. As you start new tasks, you can assign them from the list.